The Dunmer, also known as Dark Elves, are the ash-skinned, typically red-eyed elven peoples of Morrowind. [nb 1] "Dark" is commonly understood as meaning such characteristics as "dark-skinned", "gloomy", "ill-favored by fate" and so on. The Dunmer and their national identity, however, embrace these various connotations with enthusiasm. In the Empire, "Dark Elf" is the common usage, but among their Aldmeri brethren they are called "Dunmer". Their combination of powerful intellects with strong and agile physiques produce superior warriors and sorcerers. On the battlefield, Dunmer are noted for their skill with a balanced integration of the sword, the bow and destruction magic. Dunmer live two to three times as long as humans; with a 200-year-old Dunmer being old and a 300-year-old Dunmer being very, very old. In character, they are grim, aloof, and reserved, as well as distrusting and disdainful of other races. The Dunmer were born from the ashes of the Battle of Red Mountain. The infamous confrontation around 1E 700 led to the death of an ancient and respected war leader known as Lord Indoril Nerevar, the destruction of the Sixth House, the disappearance of the entire Dwemer race then present on Nirn, and the ascension into godhood of four of Nerevar's councilors and closest friends, culminating in a curse from Azura that transformed the Dunmer into their present appearance. Before that, they were the Chimer, a race of elves with skin like pale gold that followed the prophet Veloth to Resdayn (present-day Morrowind) seeking religious freedom. But the Daedra Azura (the Goddess of Dusk and Dawn and the patron of Nerevar), became angry and cursed the Chimer, turning their eyes red and their skin ashen. 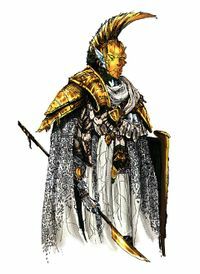 Nerevar's councilors, his general Vivec, the sorcerer Sotha Sil, and his wife Almalexia, broke an oath they had sworn to Nerevar and Azura by stealing divine power for themselves. When this Tribunal of new living gods showed no remorse to Azura, she cursed them and all Chimer, and tied together the fate of the Dunmer and Tribunal until the end of time. The Dunmer came to worship them and follow their teachings, with some notable detractors. For thousands of years, they used their power and leadership to protect the Dunmer from foreign invasion and, later, from Dagoth Ur, their ancient archenemy and the devil incarnate for the Dunmer (for he, too, had stolen divine power). After he awakened in 2E 882, the Tribunal had to donate their full attention to him, allowing for the Treaty of the Armistice with Tiber Septim's Third Empire that made Morrowind an autonomous province (and may have been influenced by the Tribunal's awareness of Tiber Septim's rise to divinity and the comparative weakness of Dunmer forces). Near the end of the Third Era, their power crumbled upon the advent of the Nerevarine, the reincarnation of Nerevar whom Azura had prophesied would come to set right the mistakes of the past. The Nerevarine, an outlander to Morrowind and purported Blades agent of Emperor Uriel Septim VII, severed their divine power at its source: the Heart of Lorkhan. The Heart had been discovered in the First Era by the Dwemer, and their plan to exploit it is what caused the Battle of Red Mountain in the first place. The Nerevarine released the Heart; Dagoth Ur, Sotha Sil, and Almalexia were killed soon after. Vivec is missing (with some claiming he has been "taken" by the Daedra). The Nerevarine eschewed taking power in Morrowind, and instead reportedly set sail for Akavir, leaving the Dunmer to make their own future. Unfortunately, that future has proven grim. In the first few years of the Fourth Era, with Vivec no longer holding Baar Dau in place, it began its descent into the city of Vivec again. An Ingenium was created to hold the moon in place, however it was powered by souls. As a consequence, a Dunmer named Sul destroyed the Ingenium in an attempt to save his lover. The moon then hit Vivec City with the full strength of its original descent, triggering a series of natural disasters that devastated Vvardenfell and the province as a whole in what is now called the Red Year. In the aftermath, the Argonian armies of Black Marsh conquered the land. The remaining Dunmer have fled to places around Tamriel, notably Skyrim and the small island of Solstheim northwest of Vvardenfell. House Redoran had created an army when the Empire pulled its forces back to Cyrodiil to deal with the Oblivion Crisis. The army was able to repel the Argonian invaders, saving the Dunmer from an even worse fate. The Dunmer are known for some of the most fascinating architecture in Tamriel. 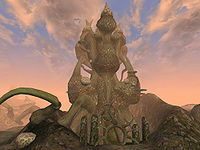 The Telvanni build bizarre, twisted mushroom towers and dwellings with magic. This style was present in Vvardenfell in the Second and Third Eras. Redoran, Indoril, Dres and Hlaalu use more conventional methods to build their structures. The Redoran build organic, crab-like houses. The Redoran town of Ald'ruhn on Vvardenfell was famous for being built around the shell of a long-dead Emperor Crab. This style was present in Vvardenfell in the Second and Third Eras. The Hlaalu build simple, cubic stone houses. This style was present in Vvardenfell in the Second and Third Eras. The style of architecture known as Velothi style is seen in ancestral tombs, ancient towers, and Temple buildings. Responsible Architecture, a style that originated in the First Era and is attributed to the Daedric Prince Boethiah. This style was similar to that seen in various Daedric ruins in Morrowind, and it was used by the famed architect Guylaine Marilie to build a prison to contain Daedra at the site where Fort Arand was later constructed. An unnamed style, featuring ornate stone buildings with peaked, shingled roofs, was common in mainland Morrowind in the Second Era and even extended into Cyrodiil. The city of Mournhold retained the style in the Third Era. Unlike their settled brethren, the Ashlanders are nomadic, and live in migrating encampments of large tents throughout Vvardenfell. All Dunmer buildings have to be well-suited to deal with the climate of their particular region, which varies greatly across the province. The Dunmer have been defined by their environment. Red Mountain looms as large in their collective thought as it does on the horizon. Its ash and lava sculpted the attitudes of Vvardenfell residents. One does not have to travel far outside of many cities to find a giant Foyada cutting through the land like a scar. Native-born Dunmer tended to look down on "outlanders", which include both other races and Dunmer born outside of Morrowind, though the intensity of this ethnocentrism varies. For thousands of years under the Tribunal, Dunmer society was structured much like the Chimer society had been: domestic Great Houses governed by Ruling Councils competed against each other for power and territory, while nomadic groups eschewed relative modernity for ancient tribal practices. Houses tend to rise and fall; many have faded to extinction over the years or sprouted up to challenge others. At the close of the Third Era, the five most important houses were Hlaalu, Redoran, Telvanni, Dres and Indoril, though it's not known how well each persevered through the cataclysms following the end of the Tribunal. Historically, Indoril has been so heavily involved with the Temple itself that it is hard to distinguish the two. In the Ashlands, native tribes ruled without laws or government and lived strictly by codes, rituals, and ancient traditions usually dictated by a wise woman or seer and implemented by a clan leader. They lived in the deserts and plains of the Ashlands and Grazelands. The "peaceful" status quo for Dunmer is still quite savage, even when led by living gods. Political machinations are constant. Assassinations are common; there's even a legally established guild providing services. A huge amount of black market activity thrives along Morrowind's extensive coastlines. Dissidents to the Temple and other subversives over the years have been hunted and persecuted. Slavery used to be commonplace. Mostly Khajiit or Argonian slaves were trafficked, although many men and mer were also enslaved. Goblins were also seen as a significant slave "resource". The Third Empire of Tiber Septim had banned slavery, but Dunmer were allowed to keep their own sacred and traditional laws in their entrance to the Empire. By the end of the Third Era, King Helseth had officially abolished slavery. Necromancy is also practiced openly by some Dunmer, though never with Dunmer corpses. The Great Houses generally follow the established Tribunal Temple, which preaches faith for the Tribunal, respect for the "Good Daedra" who recognize the Tribunal, and veneration of ancestors. There was some practicality to this: ancestral remains are used to power ghost fences to ward off spirits, notably the one created by the Tribunal that surrounded Red Mountain for hundreds of years to keep Dagoth Ur and his minions at bay. Historically, the Dunmer have resisted worshipping the Aedra of the Nine Divines, and it is likely many Dunmer will be interested in rejoining something similar to the traditions of ancestor and Daedra worship that Ashlanders have kept alive. ^ In TES II: Daggerfall, the book The Wild Elves referred to the Dark Elves as the "Moriche". For Dunmer names, see here. This page was last modified on 26 March 2019, at 17:37.